In honor of the fifth anniversary of the founding of Critical Mass in April 2006, we'll be posting some of the most popular entries from our archives. 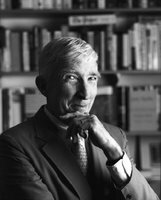 John Updike's Reviewing 101 was first published June 8, 2006, and is now being used in colleges and university classes. John Freeman, NBCC president from 2006 to 2008, is now editor of Granta. "From the Archives:John Updike’s Reviewing 101" was posted April 21, 2011.